Everyday we have a choice. A friend shared the other day two words: Doubt vs Pursue. Doubt is the enemy and Pursue is trusting in your heart. 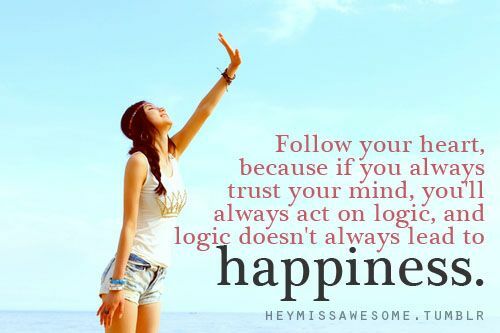 I personally got away from trusting my heart and going with logic far too much. I’ve recently written these two words down and made a vow to pursue. There’s no doubt 🙂 that doubt creeps in – in all of us, however believing in your heart (aligned with your mind) will propel us forward in finding true happiness. Sometimes people come into your life and you know right away that they were meant to be there… to serve some sort of purpose, teach you a lesson or help figure out who your are or who you want to become. You never know who these people may be, but when you lock eyes with them, you know that every moment they will affect your life in some profound way. And sometimes things happen to you at a time that may seem horrible, painful and unfair, but in reflection you realize that without overcoming those obstacles you would have never realized your potential, strength, will power or heart. Everything Happens For A Reason. Nothing happens by chance or by means of good luck. Illness, Injury, Love, Lost moments of true greatness and sheer stupidity all occur to test the limits of your soul. Without these small tests, life would be like a smoothly paved, straight, flat road to nowhere. Safe and comfortable, but dull and utterly pointless – the people you meet affect your life. The successes and downfalls that you experience can create who you are, and the bad experiences can be learned from. In fact, they are probably the most poignant and important ones. If someone hurts you, betrays you or breaks your heart, forgive them because they have helped you learn about trust and the importance of being cautious to whomever you open your heart. Make every day count. Appreciate every moment and take from it everything that you possibly can, for you may never be able to experience it again. Talk to people you have never talked to before, and actually listen. Let yourself fall in love, break free and set your sights high. Hold your head up because you have every right to. Tell yourself you are a great individual and believe in yourself, for if you don’t believe in yourself, no one else will believe in you. Create your own life and then go out and (get it) LIVE it.